5 Days of racing for the 2013 F18 Arg Nats. 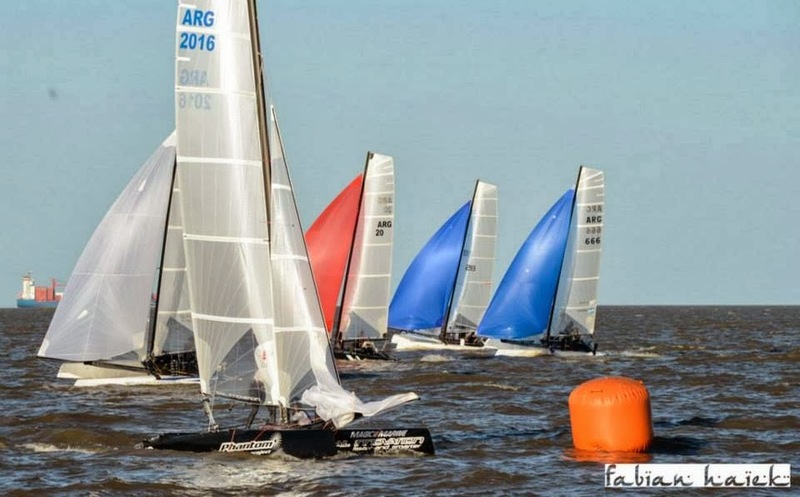 Former Tornado sailor & current Nacra 17 Olympic campaigner Esteban Blando grabs the most competitive local event yet sailing with Nico Cuaglioti, a talented Laser fleet kid with only some few hours on the Class, now sitting on top the 2 Hulls World in Argentina. In Second place Pablo Volker & Esteban Daneri, they raced at top level confirming the performance showed at BA Week and past weekend, leaving behind some experienced candidates. Pablo is part of the future Arg major sailing talent & Esteban showed that with dedicated training & guts you can crew and fight for the title at age 57! Third for Agustín Krevisky & Billy Lopez Segura, they won the last 4 races in calm weather with ease, a late reaction to aim for the title. Blando & Cuagliotti dominated the event finally with 5 bullets and four 2nds. They were a step ahead of the fleet. Smith-Heuser couldn't complete the usual podium, Mariano got sick the 2nd weekend while being 3rd overall, Lucas Authier came to the rescue and they managed a good 4th overall, Krevisky's final attack with 4 bullets in the final races was too much to defend for any team , even for the event winners. My friend Gonzalo Nieto & Ale Noe were performing for a top 5 place chance but the spreader shroud came out loose, too much of these lately. 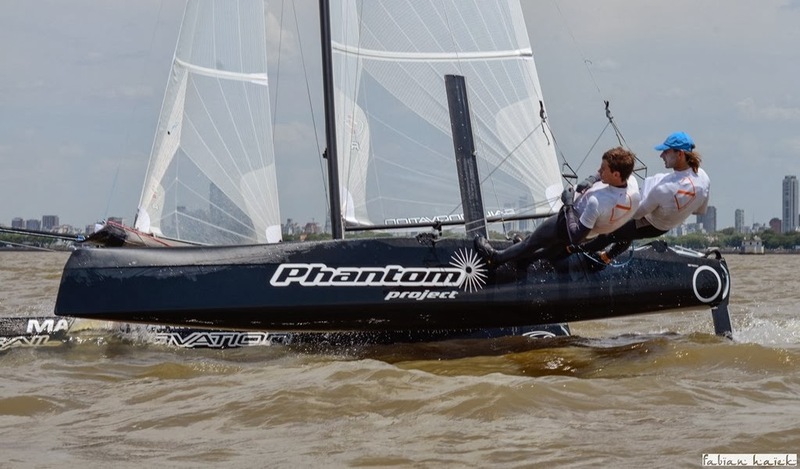 I had a really bad event, previous week I cut opened one of the hulls to fix a perfect dry from a full sinking mode, but the other went from some normal level to +20lts after each day, weight that didn´t help at all lack of speed & pointing upwind. Only managed 3 top ten in 5-6 knots , above that dead last! plus some non scores. But really happy to participate. Downwind we were fast, coming from 100mts behind after each windward mark had not much effect though, but passing the Champs to winward in one downwind leg as they were on brakes, was the higlight of the event for me. My friend Blando didn´t liked that at all as I waved him telling to change Spi...! He went mad with a formal grin and came back at us at the end of that leg to return favors! Classic moment for sure. All in all a great championship and great effort for the local class members and the organizing Club. (Club Universitario BA) , that was crowned at night with the confirmation to host the 2016 Worlds in Argentina in November. Now officially informed by Olivier Bovyn on the IFCA18 FB Website. Nice feeling having the IF18CA giving the local members the due recognition on the work done since 2006. 2016 will mark the 10th anniversary since I launched the first F18 here (August 2006) so it will be a perfect timing to celebrate the birth of the first established catamaran racing fleet in Argentina. Time to start building, again... I have my Cirrus beams & Mast already. Growing local fleet numbers and the guys travelling en masse to Worlds events since 2008 were key to finally have the chance to host it. Effort done by every single member of this great fleet. 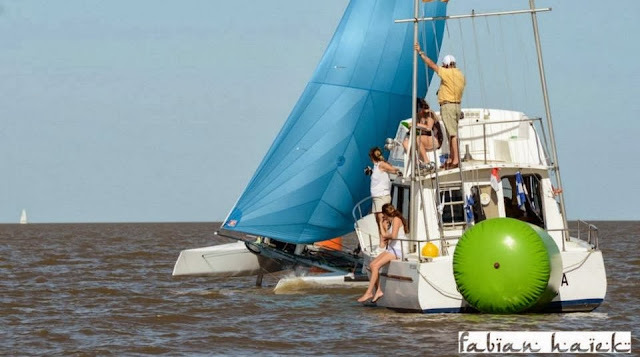 Can´t name all and the story been told several times, but worth mentioning specially these last two years Ian Rodger, Cruz Gonzalez Smith & Gabi Berberian , they were the ones putting the hours managing the class & submitting Yacht Club Argentino's bid for 2016. 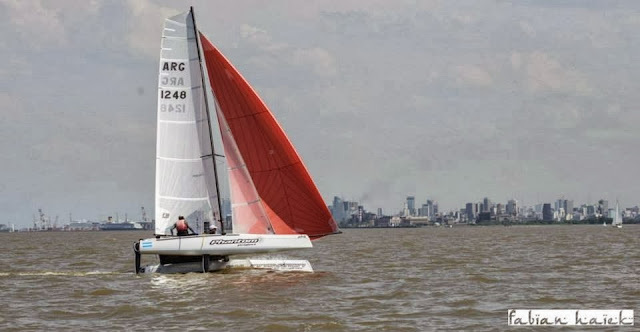 Thanks again to Don Findlay & Oivier Bovyn, helping & supporting us out since July 2005 aiming for a truly Global Class, also to former Gral Sec James Baeckler that pushed us too to create our first South Americans back in 2011, and the entire F18 World Wide for their good vibes. See you in Buenos Aires, after Rio 2016 of course!